Out with the old...in with the totally awesome! - Stop staring and start sewing! Out with the old...in with the totally awesome! I've been long over due for a new bag. I've been carrying this one around for long enough (nearly two years!) and frankly, I'm tired of it (plus it's starting to get little holes worn in it). After two weeks of being laid out by a nasty cold and tooth ache (going to dentist this week) I finally had some time to myself to sew (wait until you see the dress I made too!). 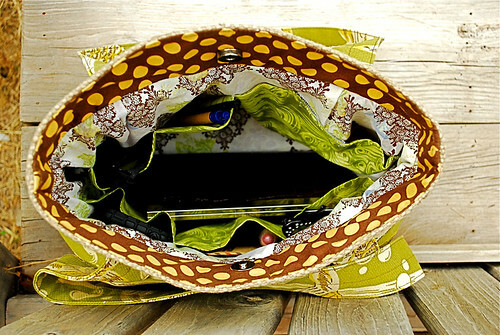 I downloaded a tutorial for this cute pleated bag here (the pattern is very nicely done and I love her version). I beefed it up with a layer of re-inforced batting inside (I didn't want to take the chance that it would flop over) and attached the straps in a different way as well. I also added a whole bunch of pockets and even made one with with a velcro closure (for my girl stuff which has a tendency to fall out at the most inconvenient times it seems). Normally I stitch the lining down at the top but there was so much bulk (due to my added batting and the jute being so thick) that I had already broken one needle and knew my machine would just growl angrily at me if I tried to sew through all that again. It's roomier than my last bag but not too big (I totally don't understand that whole massive bag thing). I really love my new bag and it really has a durable, tough quality to it (while still making me feel like a hipster gal when carrying it!). 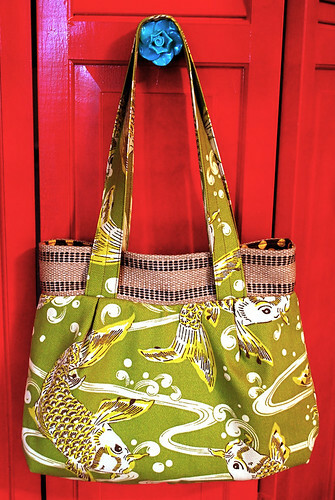 The fabric is Kool Koi from Waverly and it's sun resistant and has a rubbery-ish coating on the other side. This should keep me happy for quite awhile! Back with a pattern review on my new dress soon (and I'll spill the beans on who I had dinner with last night! ).